Tantrums on the floor and you cringe for your photographer to see? You think to yourself, “I mean, c’mon, those other families must have such well-behaved kids to keep it picture perfect for an hour.” Can I say a big NO NO NO NO NO. Gimme the tantrums, meltdowns, and time-outs. Give me the snotty noses and bed head, the chaos along with the calm that fills your life. . . .
You’re in the throes of it Ma, and you may or may not realize it, but these are the “salad days” of parenthood and you’re going to laugh one day about those meltdowns over the green beans touching the macaroni on the dinner plate. Let me document the beauty in corners of your chaos that you may be too sleep deprived and behind on laundry to soak in right now. Because one day mama, you’re going to look back and want to relive every single minute of these days. These are not your average family photo sessions. Every family has their own unique story so let's take a day to tell your story, unabridged and unscripted. This experience yields images guaranteed to bring on the happy tears during nostalgic times. There is NO RUSH! We have an entire day to allow your family to spend the day together without pressure to perform for the camera. No decisions about which activities to document, we will do them all! Morning snuggles + bedtime routines and everything in-between! An entire day of being together. There will be giggles, tears, a time-out or two, but your family will make some amazing memories together and have photographs to relive them. This session is a larger investment than an average photo session, as this collection is 8+ hours long and most likely done once while your children are young. 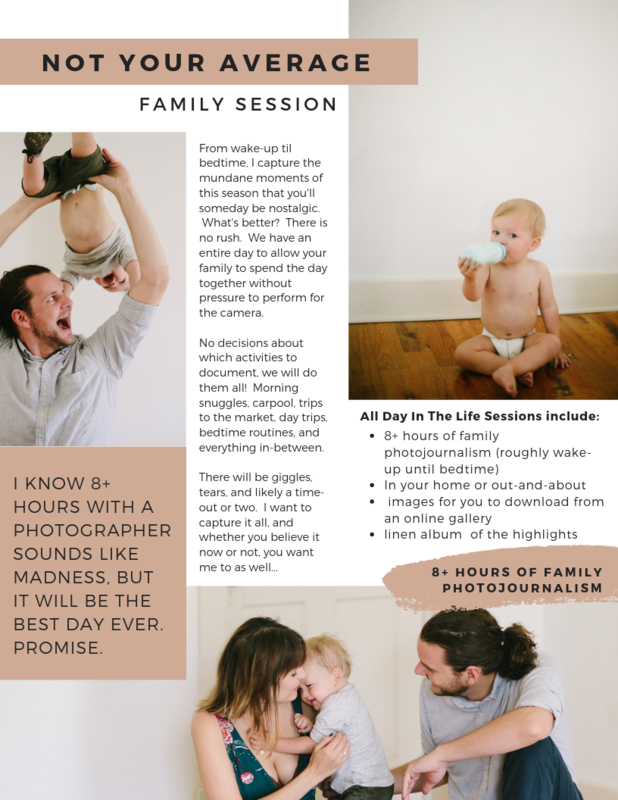 The goal of these sessions is to capture an in-depth photojournalistic heirloom of personalities for your family during this season of life. 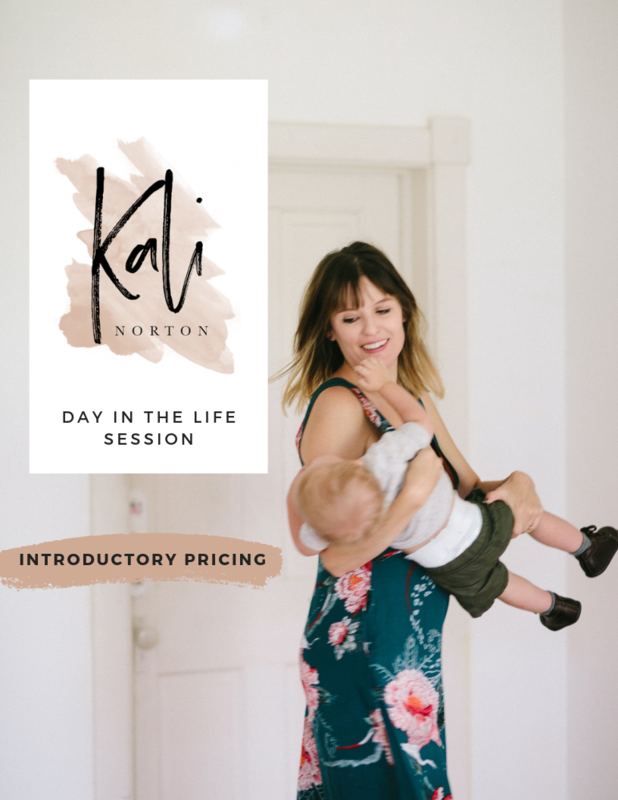 For the year 2019 only, I’m offering introductory pricing of “A Day in the Life” Motherhood sessions. Introductory pricing begins at an all-inclusive price of $1500. Payment plans are available for these sessions and can be booked up to 12 months in advance. Introductory priced sessions must be photographed in 2019. When you decide you are ready for your day in front my camera, reach out so we can pick a date. It will be the best decision you ever made in creating a personal time capsule of these ever-fleeting days.